Just in time for class on topography and rasters tomorrow: new high res shuttle DEM data is being released for Africa. 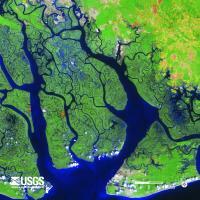 The image above shows the Niger River Delta in 90m res, 30m res, and landsat. From the press release: In Africa, accurate elevation (topographic) data are vital for pursuing a variety of climate-related studies that include modeling predicted wildlife habitat change; promoting public health in the form of warning systems for geography and climate-related diseases (e.g. malaria, dengue fever, Rift Valley fever); and monitoring sea level rise in critical deltas and population centers, to name just a few of many possible applications of elevation data. On September 23, the National Aeronautics and Space Administration (NASA), the National Geospatial-Intelligence Agency (NGA), and the U.S. Geological Survey (USGS, a bureau of the U.S. Department of the Interior) released a collection of higher-resolution (more detailed) elevation datasets for Africa. The datasets were released following the President’s commitment at the United Nations to provide assistance for global efforts to combat climate change. The broad availability of more detailed elevation data across most of the African continent through the Shuttle Radar Topography Mission (SRTM) will improve baseline information that is crucial to investigating the impacts of climate change on African communities. Enhanced elevation datasets covering remaining continents and regions will be made available within one year, with the next release of data focusing on Latin America and the Caribbean region. Until now, elevation data for the continent of Africa were freely available to the public only at 90-meter resolution. The datasets being released today and during the course of the next year resolve to 30-meters and will be used worldwide to improve environmental monitoring, climate change research, and local decision support. 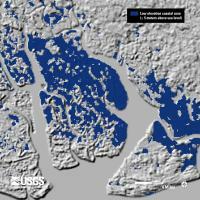 These SRTM-derived data, which have been extensively reviewed by relevant government agencies and deemed suitable for public release, are being made available via a user-friendly interface on USGS’s Earth Explorer website. Nice slider comparing the 90m to the 30m data here.